Discover a few kitchen countertop trends you will see in 2018. When it comes to designing your kitchen, one of the most important aspects are the countertops because they help tie the whole look together. 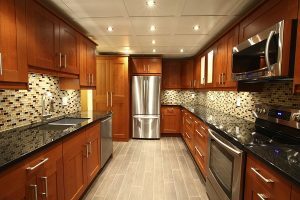 Whether you are renovating your kitchen countertops or installing ones into your new home, you need to take your time when choosing the material and style. You want to choose countertops that are durable and aesthetically pleasing. Luckily, there are a few trends you can follow to give you some inspiration during the design process. One material that is gaining in popularity among homeowners is quartz because of its strength and overall look. A major benefit of quartz is that it is non-porous meaning that is resistant to water and other liquids seeping through the surface. So, quartz is highly resistant to staining and has to go through minimal re-sealing. You will never have to worry about damaging your quartz kitchen countertops, so they are one of the most low-maintenance materials on the market. The days of traditional and generic looking kitchen countertops are coming to an end in 2018. Homeowners are beginning to choose countertops with visible veining and interesting patterns. Manufacturers are designing quartz to resemble other natural stones such as granite and marble. So you get the creative look of natural stone without the constant maintenance. Kitchen countertops with veining and patterns will add some creativity to your home. When it comes to the color of kitchen countertops, neutral tones are starting to take over bright hues such as blue. Instead, you will see more of soft grey, white and beiges colors integrated into kitchen countertops in 2018. Neutral tones are easier to integrate into a kitchen design. When natural light hits neutral toned countertops, it helps to open the entire space. This entry was posted on Sunday, January 7th, 2018 at 5:15 pm. Both comments and pings are currently closed.